Knudson Cove Marina, located 15 miles north of downtown Ketchikan, nestles into some of the best fishing grounds in Alaska. Folks come to the Marina for the day to fuel up their boats, rent skiffs, arrange for guided charter fishing, enjoy a snack from the tackle shop, or just relax on the deck! Other visitors stay several days in one of the Marina's waterfront units where they can sit on their balconies and watch the sun set after barbecuing some of their day's catch. In a short, 25-minute drive, folks are transported from the summer busyness of the city to the quiet beauty of Knudson Cove. And in only 5 to 10 minutes from leaving the Marina's dock, fisher folk have their lines in the water. Those seeking other adventures may head out of the cove on the lookout for nearby eagles' nests and seal-covered rocks, or in search of whales spouting, porpoise playing, and eagles swooping down to catch a seafood meal. Another exploratory option is to beach comb any of the many secluded beaches in the area. The Naha River - only 45 minutes from the Marina and presenting adventurers great views of significant waterfalls and beautiful little islands along the way - offers hikers a fine walk along the river and through a rain forest, a look at mossy banks and regional wild flowers, and the opportunity (from late July until fall) to spy black bear feeding on salmon heading upstream. All species of salmon spawn in the Knudson Cove area, so the fisherperson finds a haven for fishing. King salmon show up in May, peak in June, and are still caught consistently through July and into mid-August. A person may limit on silvers, chums and pinks from July on - and the limit is 6 of each! 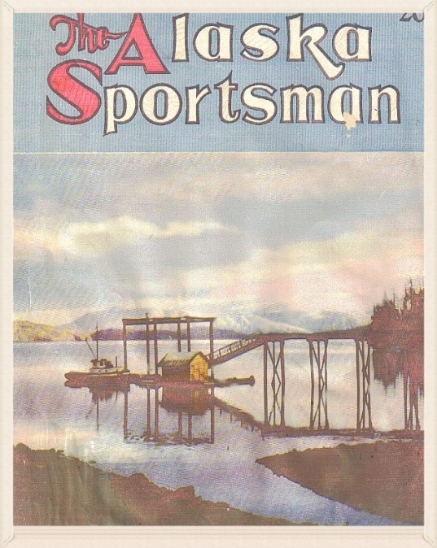 Knudson Cove in 1945 featured on the cover of The Alaska Sportsman which went on to become Alaska Magazine. Knudson Cove Marina began in the 1940's when Odin Jensen built a float and used his pile driver, and it evolved slowly through several different owners until 2003, when it was purchased by Michael & Linnaea Troina, long-time Ketchikan residents who know the area and the Marina well. The current Marina offers visitors 130 moorage slips, gear storage lockers, skiff/boat/kayak rentals, several waterfront units, a large tackle shop, liquor store, fuel service, freezer space, and private fishing charters. As testimony to the lure of Knudson Cove Marina, every year it welcomes back guests who have been staying at and using its facilities for as many as 25 summers. It is a friendly place offering all the fish and other beauties of nature anyone could want.